Or wherever you see the PREFS button. Select if you’re a gallery or an artist/owner. This doesn’t change the features available but it does adjust settings to suit the selection you make. 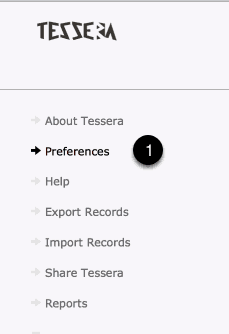 Other Preference settings are available throughout Tessera. Look out for these symbols. 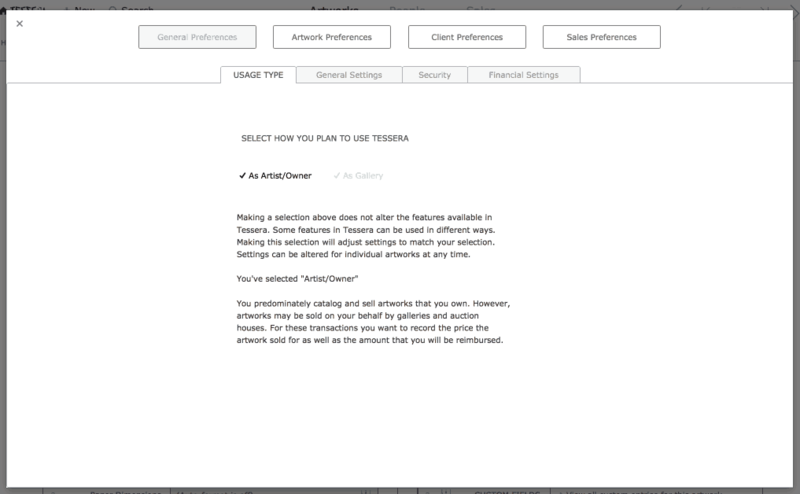 General settings for FileMaker Pro the underlying software used to run Tessera. Access the Invoice Design Component of Tessera. 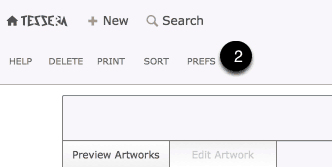 Specify when opening Artworks to which view Tessera should switch to by default and when the Edit view is opened which tab should be made active. By default Tessera pauses when closing for the option to cancel the shutdown. This feature can be disabled. If attempting to upload Tessera to FileMaker Pro Server then this feature should be disabled to prevent the upload from timing out. Tessera comes with one user account for the Tessera file username “Tessera” the password for this account is initially left blank. Tessera is pre-set to open using this account with the password automatically set to be blank. Consequently when you initially open Tessera you see no prompt for a password. It is recommended that you alter the password for the Tessera account to enable basic security for your Tessera file. Once this has been altered you will be prompted every time you open Tessera to enter the new password and will not be able to access Tessera without doing so. See Security for more details.